The Globalization team is responsible for translation and cultural adaptation of most things Netflix creates, from beautiful user interfaces to cinematic original programming. This is not just about translation, it's about providing our audience with an experience that feels local. We are doing this at scale, while managing to treat each country differently. 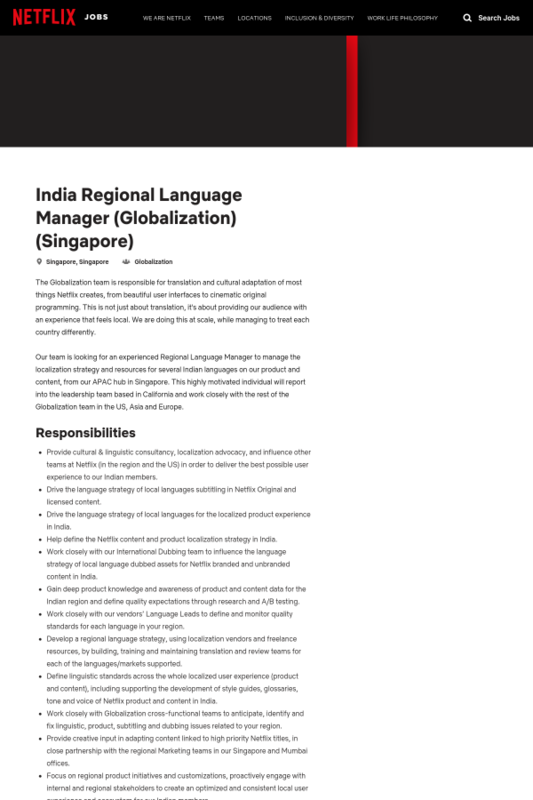 Our team is looking for an experienced Regional Language Manager to manage the localization strategy and resources for several Indian languages on our product and content, from our APAC hub in Singapore. This highly motivated individual will report into the leadership team based in California and work closely with the rest of the Globalization team in the US, Asia and Europe.